The recent storms have created a vortex out to sea. The Giants of Old Folklore have been flushed back to modern-day Cornwall from a portal under the sea — and they are causing chaos. 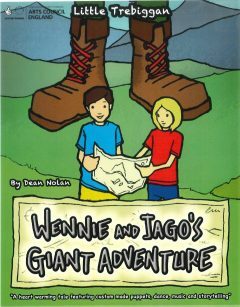 The only way the Giants can be sent back is by solving the riddles on the Giants’ secret map – conveniently found on a Cornish beach by two youngsters: Wennie and Jago. A heart-warming tale featuring custom-made puppets, dance, music and storytelling.